The Organization for Black Struggle, along with a few organizations, were honored for our consistent work for and with our community. The recognition was by the Black Caucus/Board of Alders during their annual Black History Month Program. 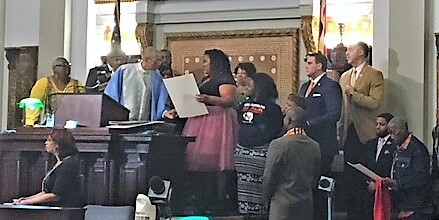 Tempestt Tuggle accepted the proclamation on our behalf. Also on hand was Kendra Tatum and Jamala Rogers.